Setting effective sales goals is a bit of a balancing act. 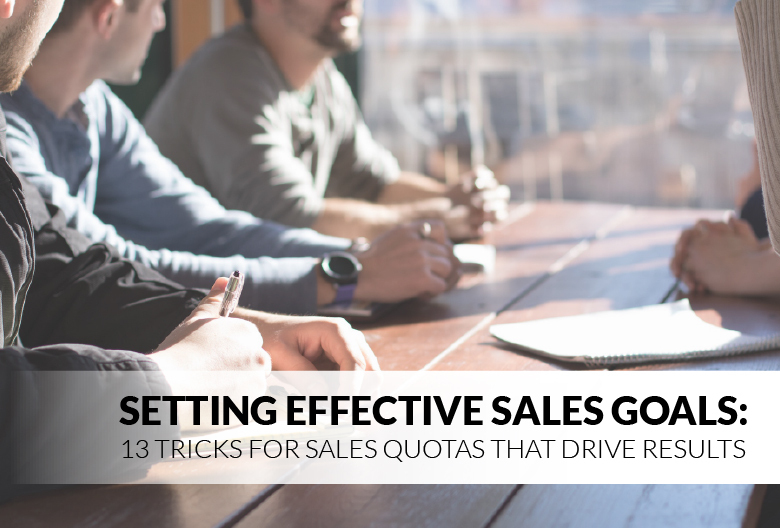 That is, your sales quotas shouldn’t be set so far out of reach that your team never hits them – but they also shouldn’t be so conservative or safe that your reps can hit them without much effort. Lean too far in either direction and your sales strategy will topple. However, if you can find a way to set realistic, aspirational, and achievable sales targets, you’re golden. So, let’s take a look at some of the key benefits of creating optimal sales goals for your team and how you can set sales goals that motivate, inspire, and drive results. Why Set Sales Goals for Your Team? Motivating Your Sales Reps: Setting sales quotas creates tangible benchmarks for your reps to strive for. You can motivate your team further by offering bonus incentives for anyone who makes or exceeds their quota. Establishing Clear Expectations: Well-defined sales quotas give everyone on your sales team a clear idea of how much they’re expected to sell within a given period. Plus, the closer your quotas are to reality, the better you’ll be able to forecast and manage your sales budget. Helping Improve Your Sales Process: Your quota attainment levels provide insight into your sales team’s productivity and sales process – and can also highlight ways to streamline your sales pipeline. For instance, if your reps are consistently struggling to meet their quotas, there are likely key issues or bottlenecks preventing them from hitting those goals. Before you set any new sales goals, you need to know where you currently stand. So, if you haven’t already, start to measure and track your team’s performance - both as a whole and on an individual level. Look at how your team is performing and the type of results they’re achieving on a regular basis. Once you determine whether your reps consistently hitting, exceeding, or missing their sales targets, you can work towards optimizing or replicating your results in future periods. If your reps are already meeting their sales quotas, one of two things might be happening. Either your sales reps are already hustling as hard as they can – in which case you should codify their processes for future training purposes – or your quotas are set too low. In the second case, your sales reps have unrealized potential that you could be tapping into with more challenging quotas. When you bump up your team’s quota, do so incrementally until you reach the upper bound of what they can reasonably achieve. Sales quotas can be measured in different ways, so it’s important to choose the right type of sales quota for your team. There are four main types of sales quotas: those based on profits, volume, activity, or some combination of these three factors. Visualize the path to your goals and break it down into manageable, actionable steps. Instead of blindly stating that you need to increase sales revenue, for example, define a value or volume that your team needs to close over a specific period or by a specific date. Now that you have specific goals in mind, you should build a schedule around daily, weekly, and monthly targets. For instance, this could include creating a list of X new leads by end of day; booking X sales demos this week; or submitting X proposals by Friday. Whatever your goals are, focus on sales activities that will bring you within reach of achieving them. If your sales reps have different abilities, strengths, or experience levels, it can make sense to set different sales targets for different reps on your team. For instance, one of your more senior reps might have established relationships with accounts that continue to bring in new revenue every quarter, while a newer team member might be starting from scratch. Remember, the key to setting effective sales goals is to find a balance. If your goals are too low, you’ll fail to inspire your team to challenge themselves - and end up leaving money on the table in the process. On the other hand, if your goals are too lofty, your reps will lose confidence and struggle to stay motivated. Which sales metrics really matter to your sales team? This can vary depending on the type of sales quotas you set, the steps in your sales process, as well as your immediate and long-term goals. For instance, if you set sales quotas based on profits, you could focus on optimizing your average deal size by targeting a specific customer type or reducing customer acquisition costs by shortening your sales cycle. When it comes to setting sales quotas, it’s vital that you’re able to back up your decisions with hard data. According to Harvard Business Review, businesses that make data-driven decisions are up to 6% more profitable than those that don’t and are 5% more productive overall. You can use a CRM platform to effortlessly track and analyze your sales data. For example, Propeller’s customizable sales dashboards ensure you always know exactly where you stand and how much your team still needs to accomplish to hit this period’s targets. If it ever seems like management has pulled a sales target out of thin air, they’re probably practising the ‘top-down’ approach to setting sales goals. That is, they’re setting quotas based on how much money the organization wants to make, rather than how much your team can actually sell. Although this approach is often problematic, it can be a decent starting point if you don’t have any historical sales data to use as a reference. The preferable alternative to the top-up sales quotas is the bottom-up approach. This method uses concrete data from your existing sales records to create realistic yet challenging quotas that align with your team’s capability. To apply the bottom-up approach, find your average closed-won rate from previous periods and multiply it by your average deal size. This will give you a rough idea of how much your sales team can accomplish in a given period. Compare how close each of your reps comes to meeting or exceeding their quota on a regular basis. If one of your reps is excelling above the rest in terms of total sales closed, meetings booked, or dollars earned, look at what they’re doing differently (i.e., what they’re doing right) and find a way to replicate those steps or their process for the rest of your sales team. There’s no point in setting sales goals that your team can never achieve. So, if you’re continually stumbling to hit your targets, take a step back and modify your expectations. Invite your whole sales team to participate in a conversation about your sales targets, challenges, and how you can best support each rep’s success. You can set your team up for greater success by providing them with powerful sales tools to help hit their targets. That includes a robust CRM platform like Propeller, which makes it easier for your team to generate viable leads, manage your pipeline, set realistic targets, and visualize your progress at every step. Ready to see how Propeller CRM can help you set, track, and crush your sales goals? Try our Gmail CRM for free today!